New Hope for Obese Americans? Volunteers in the Every Size approach were asked to find an enjoyable, appropriate form of physical activity, such as walking. The focus was on improving health, not losing weight. The “Every Size” strategy, a health-centered rather than weight-centered program, may help chronic dieters reshape their thinking, shed unhealthy habits, adopt new patterns of eating, become more physically active, and increase their self-esteem. That’s according to Nancy L. Keim, a chemist with ARS. 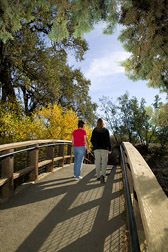 Keim and Van Loan are with the ARS Western Human Nutrition Research Center at Davis, California. The two scientists collaborated with Judith L. Stern and Linda Bacon of the University of California, Davis, in a study of the “Health at Every Size” approach. Van Loan says the novel experiment rates as “one of the most rigorous comparisons of conventional dieting versus the Every Size lifestyle.” The results? Remarkable improvements for the obese, chronic dieters assigned to the Every Size cohort, one of two teams for the study. 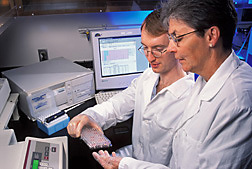 Chemist Erik Gertz and physiologist Marta Van Loan examine a tray of serum samples to be analyzed for indicators of bone formation and resorption. Seventy-eight obese women, ages 30 to 45, participated in either the health-centered Every Size team or the weight-centered traditional diet team. The teams met for specialized, 90-minute educational sessions every week for the first 6 months of the year-long study, then met for six once-a-month sessions. Both groups were instructed in nutrition basics. Women on the conventional diet track were schooled in topics that are typically covered in many popular weight-loss programs, such as how to monitor their weight, control their eating, and exercise briskly. Meanwhile, their Every Size colleagues learned how to build their self-esteem; recognize and follow the body’s natural, internal cues to hunger and satiety (a feeling of fullness); make healthy choices at mealtimes and in between; and enjoy some form of physical activity—an approach that’s different from exercising mainly to lose weight. A total of 38 women, 19 from each team, participated in a panel of follow-up exams—lab tests and questionnaires—2 years after the study’s start. Every Size volunteers had kept their weight stable, neither gaining nor losing a significant number of pounds. In contrast, the dieters had lost weight by the sixth month, but regained it by the 2-year checkpoint. Their beginning weights and their weights 2 years later weren’t significantly different. The Every Size women held onto the progress that they had made in several health risk factors such as cholesterol levels and systolic blood pressure—the amount of pressure in blood vessels when the heart pumps blood through them. At the start and end of the study, total cholesterol and systolic blood pressure were in the normal range for all the women. Within this range, however, the Every Size women lowered their total cholesterol and their systolic blood pressure and were able to maintain those reductions for the entire course of the study. In contrast, the dieters didn’t lower their total cholesterol at any point in the study. And they weren’t able to maintain the healthful decrease in systolic blood pressure that they’d achieved just after the 6-month reducing-diet phase. At the 2-year point, Every Size team members had nearly quadrupled the amount of time they spent in moderate, hard, or very hard physical activity, compared to what they had reported at the study’s outset. The dieters didn’t fare as well. At the 1-year point, they were exercising more than at the start, but they didn’t sustain their improved level to the 2-year checkpoint. Although all the dieters made a lasting improvement in at least one of the food-related habits called “eating behaviors,” the Every Size volunteers improved in more of the categories. For example, both groups did a better job of regaining control of their eating after they’d broken some eating-related rule that they had imposed on themselves. But the Every Size women made more progress—and sustained it—in other facets of eating behavior. The Every Size team members, for instance, had apparently come to terms with issues such as bulimia (binge eating followed by purging), a “drive for thinness,” and dissatisfaction with their body size. Dieters made initial improvements in handling bulimia, dealing with body size, and learning to follow the body’s natural signals of hunger and fullness, but they didn’t maintain the progress they’d achieved in these areas. The researchers also monitored de-pression, a common problem among large-sized women whose low self-esteem may be related to their body image. Both groups made significant strides in lessening depression, but only the Every Size women were able to preserve a more optimistic outlook. At the 2-year point, volunteers answered questions about how helpful the program was to them. When asked whether they’d continued to implement some of the tools they’d learned, 89 percent of the Every Size women answered “regularly” or “often.” Only 11 percent of the dieters did so. Focusing on health and on changing behavior, instead of on weight loss, apparently acted as “keys to the successes of the Every Size team,” Van Loan points out. The scientists discuss these and other conclusions in an article in a 2005 issue of the Journal of the American Dietetic Association. The National Institutes of Health and National Science Foundation provided some of the funding for the study. For many people, weight-loss diets “simply don’t work,” says Van Loan. The Health at Every Size strategy “may break the cycle of unsuccessful dieting” and open the door to happier, healthier lives.—By Marcia Wood, Agricultural Research Service Information Staff. Marta D. Van Loan and Nancy L. Keim are with the USDA-ARS Western Human Nutrition Research Center, One Shields Ave., Davis, CA 95616; phone (530) 752-4160 [Van Loan], (530) 752-4163 [Keim], fax (530) 754-4376. "Health at Every Size: New Hope for Obese Americans?" was published in the March 2006 issue of Agricultural Research magazine.